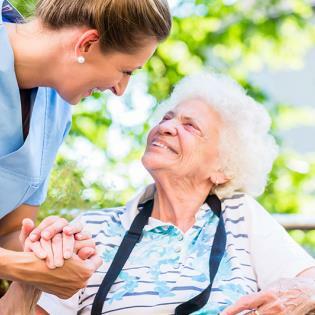 Bingham Memorial’s Skilled Nursing & Rehabilitation Center offers comprehensive rehabilitation services for patients who no longer require acute care in the hospital, but who need additional short-term care before being fully discharged. We provide a safe and secure environment with mentally stimulating social activities and exercises to help our guests become stronger while recovering from a surgery, illness, or injury. In concert with our dedicated medical and rehabilitation teams, a recovery plan is tailored to meet the needs of each individual patient and to achieve optimal outcomes. Our first priority is to meet the total healthcare needs of our guests in a caring and compassionate manner. You or your loved one will feel right at home with a comfortable room for resting and privacy, and you can feel confident in the exceptional services that we have available—unmatched by any other facility in southeastern Idaho. We arrange adult day services 24 hours a day, 7 days a week. Our home-like facility has around-the-clock professional nursing care, an internal medicine doctor during the week, and physicians always on-call. Additionally, a therapy team develops an individualized exercise regimen and works with patients to achieve their goals and maximize positive outcomes. Financial counselor to assist with insurance approvals and financial planning. In-house treatment nurse to monitor and care for your skin. Licensed social worker to help with discharge planning and home medical equipment. Registered dietician to ensure proper nutrition needs are being met. Q: Is a person's age a factor? A: We accept adults regardless of their age if they have a need for our services. A: Yes. Many people do not know that Medicaid will actually cover programs like our Adult Day Services. Our financial counselor can help submit the necessary paperwork to Medicaid for your loved one. We also accept private payment if your loved one is not eligible for coverage under Medicaid or other insurances. Q: Can people with Alzheimer’s disease, dementia, or memory loss stay at our facilities? A: Yes. We provide specific programs to meet the needs of patients with memory loss and our staff is specially trained to manage the care needs of individuals with Alzheimer’s disease and dementia. For additional information or to schedule a tour of our facility, please call (208) 785-4101. Our facility offers superior caregiving by providing the following services.